Wonder Boy is really where it all started. Developed by Sega and Westone for the arcade, the game was a fast-paced platformer starring some boy, presumably wonderful, trying to save his girlfriend from some monster, and doing so shirtless in a kilt made of leaves. Now that takes some brass balls. Wonder Boy plays as a platformer designed to eat your quarters should: it is very challenging. A lot of that challenge comes from the slipperiness of the character, a one-hit-kills-you design philosophy, and especially a strict time limit. Oh, no, there is no countdown ticking away in the corner of the screen. Instead, you have a "hunger meter" which slowly drains away unless you can keep feeding Wonder Boy fruit. 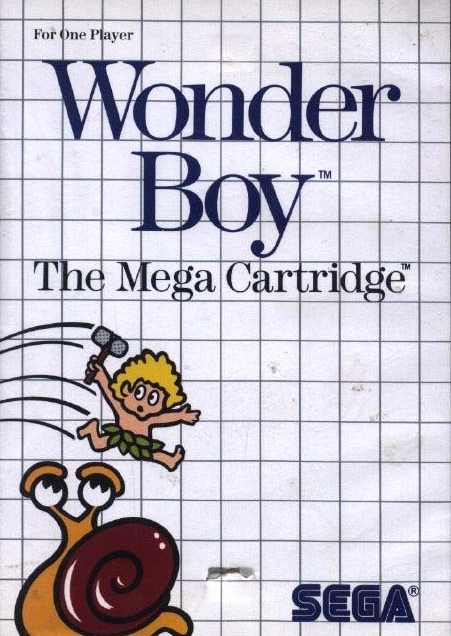 The title did well for Sega, and Wonder Boy became one of their mascots, enjoying about the same level of popularity as Alex Kidd (who?). But interestingly, Sega only owned the rights to the character and the lore of the game. The level design, the gameplay, the code, all of that belonged to Westone, who decided to team up with Hudson Soft to create an NES version of the game. The character still wears only a bunch of leaves, still uses the same weapons, still has to satiate his hunger with fruit, except that this time, the hero is not the blonde and lean Wonder Boy, but instead a chubby guy with brown hair and a cap, named Master Higgins after Hudson Soft's spokesperson in Japan. He looks nothing like him. The games are almost identical, except that most people would agree that Adventure Island looks much worse. So, you can chose whichever version you like (both are 500 pts on the Virtual Console) and start playing and discussing (and possibly cursing!). edit - As Roykoopa suggested, why not add either Wonder Boy or Adventure Island to your collection, and indicate you are currently playing it? Hmmmm...yeah, I think I'll take part in this one. I recently got a video capture device, so I can even post some embarassing deaths from my first-ever playthrough of this slippery, tough platformer. But they're really the same game? Like, same stages and everything? I'll probably go for Wonder Boy if that's the case. Pretty much everything I've read says "near identical", so it's a safe bet. I guess I'll go for Wonder Boy as well. Wait... they cost the same, right? @Guillaume Roxio Game Capture. Launched a few weeks ago, 480p only, $99, component cables only, hooks up to PC via USB, comes with what seems to be pretty basic editing software to me. It was $79 when I got it, special launch price, might still be at that price if you buy from their website. If not, let me know and I'll see if I can dig up a link or something. I'll start on this as soon as I can. I've got the points ready for downloading Wonder Boy, but IRL stuff will be inhibiting my progress for the next few days (my play is opening in a couple hours!). I'll update when I've started playing the game though. Downloading Wonder Boy now, not sure when I'm going to get to play it. Also, looking up the series on wikipedia and wow... the naming conventions are confusing as hell. And a ton of the games are up on VC! Holy F, I hate this game already. Nah, not really but... are we sure it is the same game as Adventure Island?! I thought I remembered Adventure Island feeling better. He moves like he is walking on butter. Also, I don't get how to jump high versus low, and you need high jumps. Also, there is a part in the first stage where there is this floating platform you need to jump on but it is only there like half the time. /EDIT ok you do the high jump by holding down the 1 button when you jump. Walking on butter sounds like a dream come true! I chose Wonder Boy. I gotta say, I've been breezing through the first three areas (but the brief time I spent on area 4 makes me think the difficulty ramps up considerably. The funny thing is I don't even remember getting to the first boss in Adventure Island. I gotta echo the "are we sure they're the same game" sentiment, as Wonder Boy seems considerably easier. So far. If I'm not totally sick of the game by the time I finish it, I may end up getting Adventure Island as well for comparison. Anyway, I'm enjoying the game way more than I remember ever enjoying Adventure Island. I like the bright colors. Though I do wish there were more music tracks, you get to hear that little chirpy tune a whole lot. You really had that much trouble with the first game?! I think I played it in the past, and I don't remember it being too difficult early on. I don't remember exactly, I just remember it was a combination of difficulty, skateboard, and boredom. Playing now. Oh yeah, I definitely remember this title now. I recall this being one of the few NES titles to actually make me throw my controller. I shall defeat my demons! Shucks, I'm gonna feel a little disconnected when talking Adventure Island vs. Wonder Boy (I have AI on the NES, playin' it old-skool, yo). At the end of the first level (1-1), there's a hidden egg right by the ledge near the Goal. Make sure you get the Hudson Bee inside, because it's the only way you can continue (and you don't want to play through this game with a mere 3 lives). To continue after you get the Bee, hold right and press start when you get a Game Over. I am wondering if I'm the only one doing AI though. Zero - I haven't played Wonder Boy but AI 1 had a pretty slippery Higgins. And to jump high, you do indeed hold down 1 (works while standing or running). Hey, we started playing Wonder Boy yet no one had it in their Negative World game database indicating "Now Playing?" For shame! Heh, anyway I added the game to the database so we can easily see who's playing the game together. Won't that be neat! Just click here and check the appropriate boxes. Simple! Fortunately for those who decided to start with Adventure Island, we have an entry for that as well. Guillame, feel free to add this info to original post. If you want! I need to get to bed now, but I did buy my copy of Wonder Boy and will try to spend some time with it this weekend. I finished the first area and a half or so. It's easy enough to burn through these stages, albeit it probably gets a bit tougher later on. So far I'd say... it's ok. But without the dinosaurs it seems to be missing a bit of something. I got the game and started playing it. This is really fun so far! I've only made it to stage 3, but I like how the game encourages you to run through the stages as fast as possible. The skateboard is a power-up, yet it also prevents you from backtracking, while simultaneously letting you move super fast, so the game keeps you moving forward. It gets pretty intense at times; often times I'll be going at full-speed, and I think I'm about to die when a platform or something rises up just in time to save me. It feels like these levels were playtested very thoroughly, to ensure that speedy playing would be rewarded. EDIT: I'm at Area 2, Round 4 now, and I'm honestly a little surprised that I'm enjoying the game this much. I've had to continue a few times already, but fortunately infinite continues plus the VC save state feature means I'll be able to make significant progress in this game. Walking on butter does sound pretty cool. Kind of like walking on sunshine, except butter >>> sunshine. @X-pert74 Are you playing Wonder Boy or Adventure Island? Anyway, no one mentioned it yet, but Wonder Boy has a stage select cheat, and it's given to you right in the game manual! (see page 4, "Getting Started)." See, it pays to read the instructions sometimes. Wonder Boy is kind of cool but simple in the first batch of worlds. The bright colors remind me a lot of another Sega Master System game I played on the VC: Alex Kidd. A simple melody plays in the background for all the levels, but it's so catchy. The jump detection is a bit wonky, but I'm getting used to it. I'm at Area 2 Round 3, and started using the skateboard. I died at one part because the platforms blended in right with the background, making it difficult to discern the two! But it's all good, I will keep on playing after I'm done with my errands. @roykoopa64 I'm playing Wonder Boy. So, what version should I download?